Go in one year and out the other! Here we are at the end of 2012. Are you thinking of your new resolutions? How did you do with the ones you made last year? I am ending the year weighing less than I started by 20 pounds and wearing a size 16 jean, and having competed in a mud run obstacle race. Not where I wanted to be at this time, but better than I was and having accomplished things I never dreamed of. I did not start out my new birthday year with a workout. I had been fighting a sickness when I last blogged and hopeful I could beat it. Illness had other plans and I celebrated Christmas hacking up a lung without a voice. Best laid plans right. I’d like to say I will ring in the new year with a workout, but as I sit here and think of all I need to do and the plans we have I don’t think it will happen. It is still on my “To do” list though. I do want to end this year with a huge “Thank you!” to Miss AB! Because you started this blog I have had the accountability to follow through with my goals to the best of my ability. I have surprised myself this year with what I can do. I never would have even considered a 5k let alone an obstacle course had it not been for you. And here I am starting the next year by putting race dates on the calendar! For Christmas I gave my husband a gift from his bucket list. A half day zip-line tour and surprised him again with the fact that I was going with him. I never would have done it before. There are weight limits for zip-lines and I have either exceeded them or been close enough that I was too embarrassed to try. I have avoided many things in my life due to my weight. I am on my way to enjoying life more with my husband and kids and getting off the sidelines. You have also been a dear friend outside of this blog. Thank you for everything! Lose more weight this year than I did in 2012. Read more books than I did in 2012. Run a 5K in under 30 minutes. Have more dates with my husband than I did in 2012. I hope you all begin the new year with your loved ones, ready for great blessings this new year! We all have dreams, in order to make dreams come into reality, it takes an awful lot of determination, dedication, self-discipline and effort. Slow and steady wins the race. Isn’t that how the saying goes? You know from the fable about the tortoise and the hare? The hare is all gung ho but easily distracted. The tortoise may be slow, but he’s consistent…and has a hard shell and he’s green. I like green. Since starting this beautiful blog in September I have lost just over 15 pounds (latest scale picture below – happy dance!) and since I started measuring in October I’ve lost more than 6 inches! Maybe that’s not something that would sell a miracle pill, a workout program, a gym membership or a workout DVD, but I’ve got nothing to sell. I’m just sharing my story (of course, I wouldn’t pass up big bucks to write a book, but nobody is knocking at my door). My story is about making the little changes, fixing bad habits, and sticking to it. I’m not racing to a goal weight. I haven’t even set a goal weight. I want to be a healthy weight. I know it’s less than 170 which is what I weighed when I got pregnant with my oldest. Other than that I figure I’ll recognize it when I get there. This time of year people are making resolutions, but they seem to dissolve quickly into “Things I Wish I Had Done This Year”. So! Let’s talk about how to do it right. Like I said I don’t have a goal weight yet. My goals now have to do with changing bad habits and increasing the frequency of good ones. If you want a goal to work it needs to be specific. Rather than “eat healthier” I make specific goals to improve a good habit (or change a bad habit) one at a time. My most recent goal is to eat more vegetables. Next you need to make a plan. Not much gets done when you just say, “I think I’ll make twice as much money this year as I did last year!” It may be positive thinking, but unless you have a plan of action to back up your goal it is not likely to come to fruition…works the same with eating more veggies (or working out more, etc). My plan includes going through the produce section EVERY TIME I hit the store, even if it’s just for one item. Keeping my refrigerator stocked with veggies I enjoy is key to making sure I’m eating them. Additionally, I add a serving (or sometimes a salad) to my lunch. I’m a lunch on the run kind of girl, so this helps me to eat more than just a turkey sandwich or reheated main dish from last night’s dinner. If you’re making changes to your diet and exercise plan during this new year I invite you to be a tortoise. Slow and steady. I was looking back at my scale pictures and realized over a few weeks I went back and forth with the same five pounds, but I’ve beat that hurdle and am now in the 220s! Exciting!!! I suppose that’s another goal I’ve set for myself: to accept the slow and steady of 2012 and not give up when it gets hard. The last week of 2011. That seems so very strange to say, afterall so much has happened this year, it seems almost surreal that it is ending. HOWEVER, I am not sorry to see it go. 2012 will bring challenges, to be certain, and also amazing..wonderful..fantastic changes that I am more than ready for!! 5. My 1st experience with a Tornado siren going off, and heading to the basement. 4. The love of my life COMING HOME from deployment. 3. Reaching my 6th month post-op and having lost 90lbs!!! 2. Buying our 1st Home!!!! 1. Trying on a formal gown for my husbands Military Ball…and fitting into a size 14/16!!! As I typed this list I realized just how much I really did this year, and a lot on my own. It really opened up my eyes to what I am truly capable of. No excuses, no whining. I CAN do this. The #1 item on my list happened last night when I went ball gown shopping with my husband. May of last year I was wearing a size 24/26 to his OCS formal. It was such an amazing feeling having the sales lady actually tell me the sizes I was trying were too big, and getting smaller dresses. WOW. I had to keep myself from crying. Looking at that girl in the mirror, I realized I was within 15lbs of where I was when I married my wonderful husband..16 years ago this Friday. That made me really feel like I had come a complete 360 from the start of this year. I am not “skinny”. I am not “obese”. I am in between and HEALTHY. I have given myself and my family the gift of years, together, because of the weight I have lost. 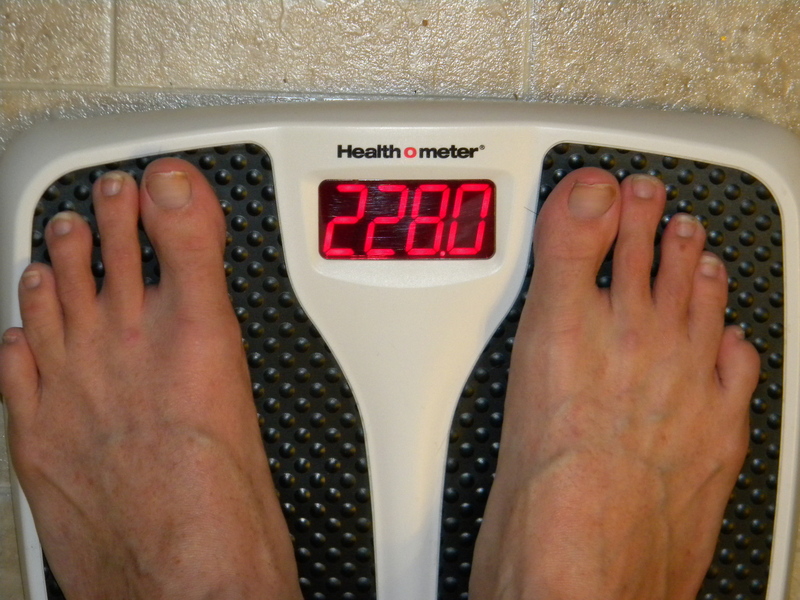 328 lbs is where I started 2011, and I am leaving it at 235lbs. 93lbs..GONE. Never coming back!!! As Walt Disney said..”we should Keep Moving Forward..” that is exactly what I intend to do. MOVE Forward. Afterall..there are LOTS of roads near my house I have yet to walk and explore. Happy New Years everyone. Dream big, and become those dreams!! !